We’ll find out what brought siblings together to compete on a high school rowing team then go into the kitchen with the chef behind Root 174 restaurant in Regent Square. We meet a local artist who finds inspiration in Panther Hollow before taking a glimpse at an exhibit centered around the history of the American flag. Chris Fennimore tells the story of the handmade American flag his father stitched while serving during World War II. Then we’ll introduce you to a local veteran who survived the D-Day landings and the Battle of the Bulge before taking you on a tour of the historic Mansions on Fifth Avenue in Shadyside. In this episode we bring you a report on the Power of 32 initiative, a project aimed at increasing the financial, political and intellectual power in 32 counties in Western Pennsylvania, Eastern Ohio, the West Virginia Panhandle, and Western Maryland. In this episode, a behind the scenes look at the making of Pittsburgh from the Air. Also, Michael Bartley reports on the Power of 32's goals and strategies for improving education in our region, and Tonia Caruso introduces viewers to a senior softball league where all of the players are are least 65 years young. In this episode, an in-depth look at the Power of 32 regional visioning initiative, which proposes using the Power of 32 counties in four states to create one vibrant region. Tonia Caruso shows viewers how the group's goals could help the region's economy and Michael Bartley focuses on the proposals for improving transportation and infrastructure. The episode also includes a one-on-one interview with Pennsylvania Senator Jay Costa, an early proponent of the Power of 32. 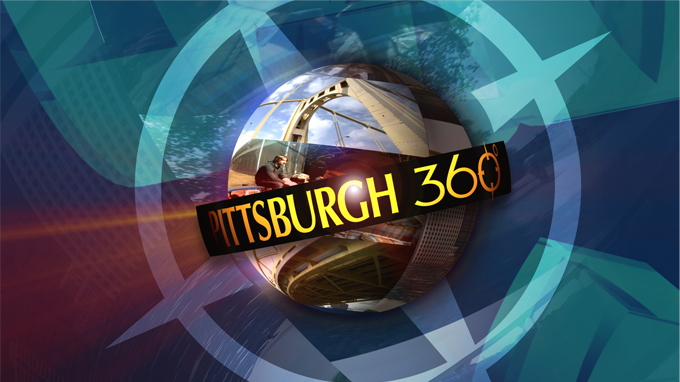 In this new episode of Pittsburgh 360, learn about the latest Pittsburgh fashions, meet some volunteers who carefor rabbits and join the fun of an up and coming sport that combines bicycles and the traditional sport of polo.